My kiln is almost done cooling. I can take my work out in a couple hours. This waiting time is so nerve wracking! I'm always so excited! How will it look? Have I blown anything up? Did the glazes turn out ok? How many pieces am I going to love and how many are going in the trash? In anxious anticipation of opening the kiln and seeing how this firing went I need to post the reason for my anxiety. 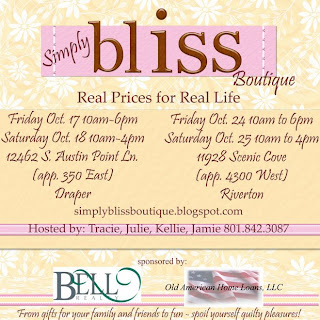 I'm going to show some work at the Simply Bliss Boutique (see above). That's almost worse than opening the kiln. How is it going to go? Is anyone going to like what I'm showing? Will anyone buy anything? Will anyone be a bigger critic than I am? It's been a long time since I've had to put myself out there. I'm not sure my skin is as thick as it once was.